My best friend came over for dinner last night, so I whipped up a lovely salad. Those pears I got from the Food Bank last week are ripe and I need to be using them up quickly, so I decided on a salad with pears. First I sliced 1/2 of a yellow onion on the mandolin so I could get super thin slices. Then I cut up 5 of those mini peppers. (A 4 pound package of mini peppers costs less than 3 regular red peppers.) into thin strips, removing the seeds. I also corned and sliced three Bosc Pears. I put all of this in a plastic container with a lid. I added 1/3 cup rice vinegar, salt, pepper and 1/2 tsp of dry mustard powder.I put the lid on and shook it all as much as I could to mix it together. Then I added about 6 cups of baby spinach. Put the lid back on, shook some more and put it in the fridge for about an hour. I toasted some hazelnuts (about 1/4 cup) with tajín (a spice mix of lime and chilis) in a dry pan. To serve, I put the salad mix on the plate, added some hazelnuts and slice some asiago cheese on top. The flavor is a wonderful blend of sweet, sour and a bit of heat. The hazelnuts are a great crunch and it was one of the best salads I have come up with this year. Service two. A fast and easy lunch made with just a few ingredients. In a sauté pan, I heated 1 TBSP of olive oil and added a pinch of anise seeds to it. When the aroma filled the air, I added 1/2 of a yellow onion, sliced thin along with 3 small peppers (the mini red peppers. I actually used a red, orange and yellow) or 1 large red pepper, cut into stripes. Add salt and pepper and let cook until tender. I sliced two small zucchinis into little rounds and added them to on top of the onions and peppers. Then I cut about a 10 cherry tomatoes in half and tossed them on top with some salt and pepper. I let them cook for a while until tender. Lastly I grated a bit of parmesan on top and let it melt. This made one large serving for a lovely, flavorful lunch. Anise is usually used in cookies and candies, but it is amazing with vegetables. It does not add a sweet flavor, it adds a subtle bite, sharper than you might imagine, but so delicious. It’s fun to experiment and this was a good one. I had some ground turkey that the store had overground, it was closer to meal than meat so the only thing it was suited for is meat balls or cutlets. So, that’s what I went for. Prepare the vegetables in advance. In a small pan, melt 1 tsp of butter and sauté on medium heat until tender the following veggies. Add salt and pepper. There won’t be any butter to drain. Just toss into a bowl with the following ingredients and form into small cutlets. The flax seed doesn’t add any flavor or anything. They are just a good source of antioxidants and other health benefits. Cooking releases their optimum benefits. Mix cooked veggies to ground turkey and saltines. Heat a skillet to medium heat with just enough olive oil to lightly coat the bottom. Add the cutlets to the pan and cook, turning when browned on one side. Cook until browned on both sides and then put a lid on it, setting it aside on a low heat burner while you toast the bun. Flip turkey cutlets after one side has browned, brown the other and then cook on low with a lid on it to cook the meat thoroughly. 1 baguette sandwich bun, sliced and toasted on a griddle. For the mushroom sauce, use the small pan you cooked the veggies in. Melt 1 TBSP of butter. Add garlic cloves, then the mushrooms, paprika, salt and pepper. Sauté until tender and add white wine, cook it down and add sour cream. Meanwhile, chop some fresh cilantro to top the sandwich. This makes two sandwiches. There is plenty of sauce from the mushrooms that you don’t need butter or mayonnaise on the bread. Oops, part of a cutlet broke off Add mushrooms and cilantro on one side, cutlets on the other. No mayo or butter needed because the mushroom sauce has plenty of moisture.The sandwich is so delicious, that little bit of fennel is everything. For a fulfilling, but easy, breakfast bagel, I fried one slice of bacon. When it was nicely crisped, I removed it and let it rest. While it cooked, I chopped 2 tbsp of yellow onion, 2 tbsp of fresh red pepper and 2 stalks of fresh kale. I chopped everything to about 1.4 inch size. After I removed the bacon slice, I tossed the onions in the bacon fat along with a pinch of anise seed. I let the onions get tender and added the red pepper. 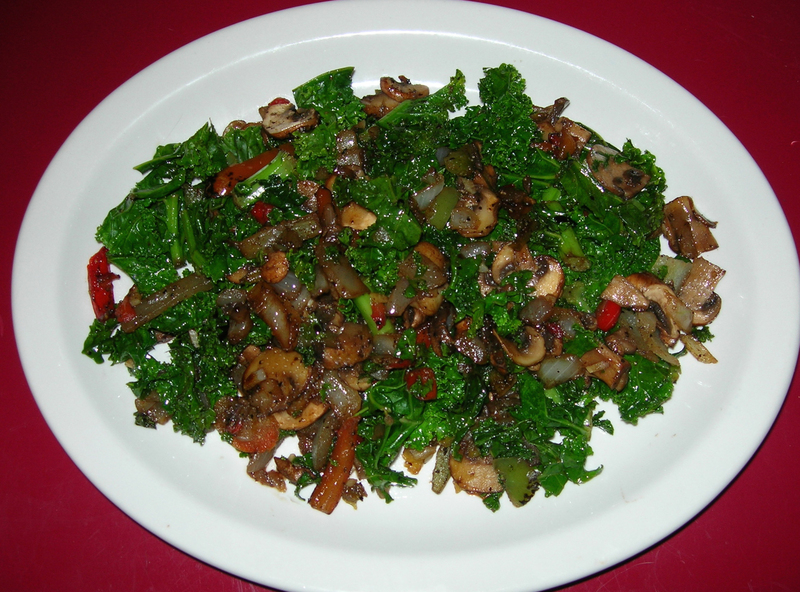 When the red peppers softened just a bit, I tossed in the kale. As soon as I added the kale, I put an Everything bagel in the toaster to toast. When it popped up, I spread some cream cheese on each half. I then spread the kale and red peppers on top of the cream cheese. I sliced the bacon into 4 pieces and put two pieces on bagel half. This made two servings, or two half bagels. 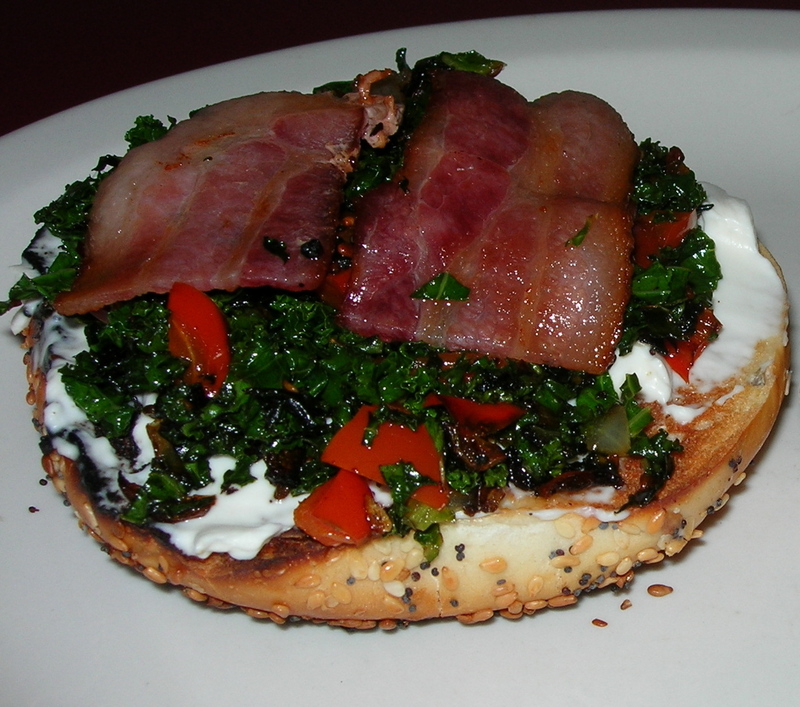 You could make a vegetarian version without the bacon because the kale was delicious with the cream cheese and bagel on its own. I was DJ’ing at The Velvet this morning and wondering what to fix for breakfast. I asked for ideas and Bushido Fretwork suggested caramelizing onions and brussels sprouts with some bacon. Well, everything goes better with bacon, so I decided to try it. I fried two slices of bacon, removed from the pan to a paper towel. While the bacon was cooking, I chopped up 2 TBSP of yellow onion, 2 TBSP of red pepper and 5 brussels sprouts. I added 1/2 tsp of dry oregano and the onions and let them start to caramelize before adding the red peppers and brussels sprouts. 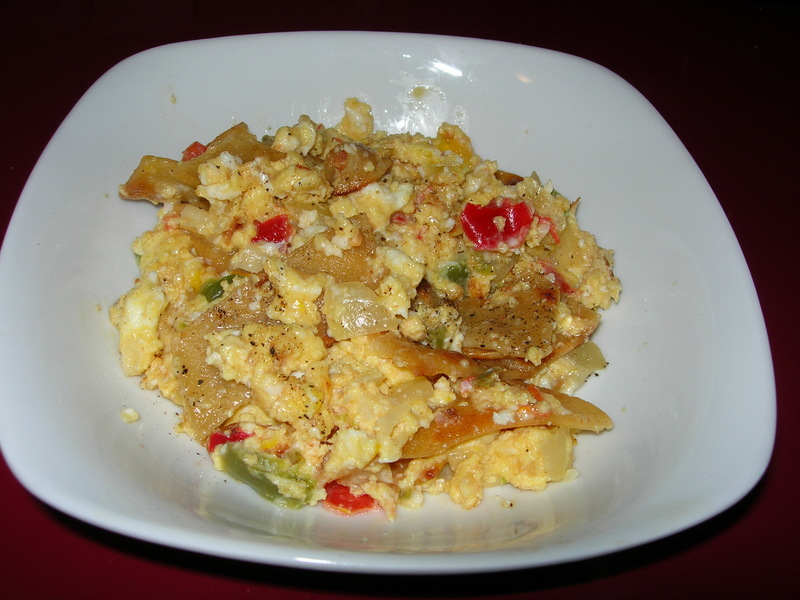 While the veggies cooked, I mixed 3 eggs with 1 TBSP of flour, salt, pepper and 2 tBSP of water. I spread thinly on a large griddle set to 250° F. I then cut the bacon into long strips and chopped them into pieces about 1/4 inch or so, the same size as the onions and red pepper. I mixed with the vegetables and set aside. I also mixed 2 TBSP of sour cream with 1 tsp of dry dill weed, 1/2 tsp of garlic powder and some salt and pepper. 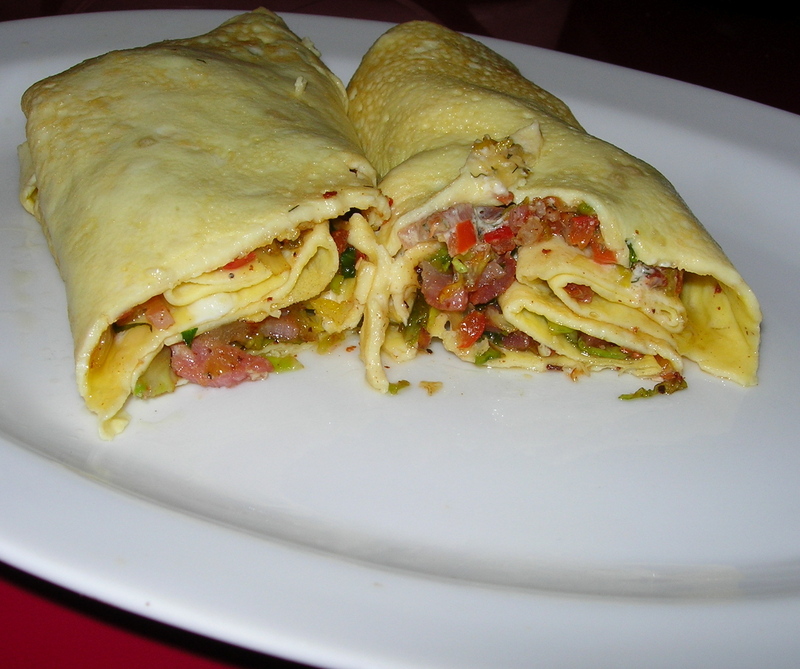 I let the omelet cook until the top was close to done, then spread the sour cream across the inner circle of it and then I spread the bacon and veggie mixture and turned the four sides over, enveloping the veggies, before rolling the omelet. It was delicious and the freshness of the sour cream was a perfect accompaniment. This is a simple salad that you can chop and mix up while frying a chicken tenderloin to cut up and add on top of the salad. Now, to make breading, normally you use an egg with a bit of water and beat it. However, that makes enough breading for a a dozen tenderloins, not just one. If I were making a big batch, I would probably use an egg, but I am not, so I used a teaspoon of plain yogurt that a rubbed onto the tenderloin before dredging it in a mix of 1 TBSP bread crumbs, 1/2 TBSP of grated parmesan cheese, salt, pepper and paprika. I used a small skillet with just enough olive oil to cover the bottom and sauteed at medium high for about 3 minutes on each side. You will still get a nice, flavorful crust, though it won’t be as thick as one made with eggs. While the chicken sauteed, I cut up 5 leaves from the heart of the romaine. I chopped up 1 small pink lady apple and 1/4 of a red bell pepper. 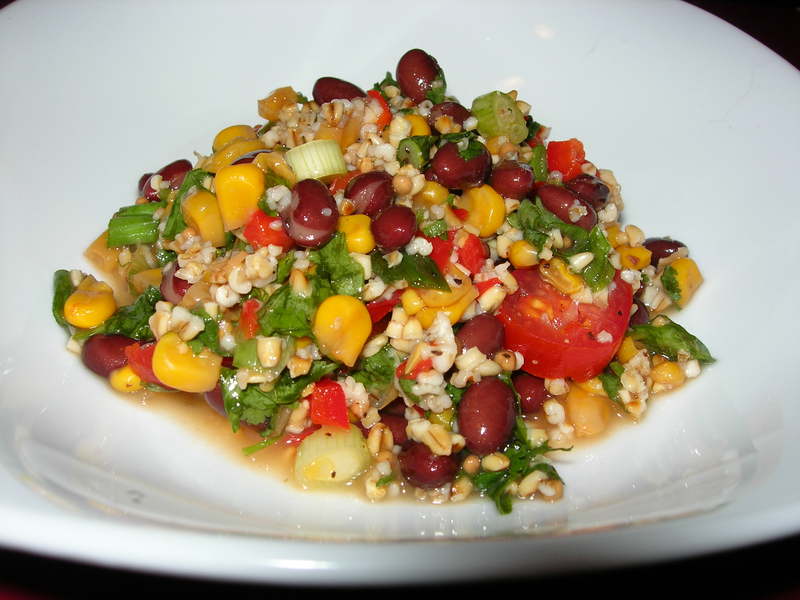 In a bowl, I mixed the lettuce, the apple and bell pepper and added a small handful of sliced black olives. I sprinkled about 1 TSBP of balsamic vinegar and 1 TBSP of olive oil on top and tossed lightly to mix the dressing oil and vinegar with the salad ingredients. Then I added some salt and pepper and laid the salad on a plate. By then the chicken tenderloin was finished, so I sliced it into about 8 or 9 slices and spread them on top. I really like the fresh hot chicken with the cold salad, the contrast in texture and heat is lovely. 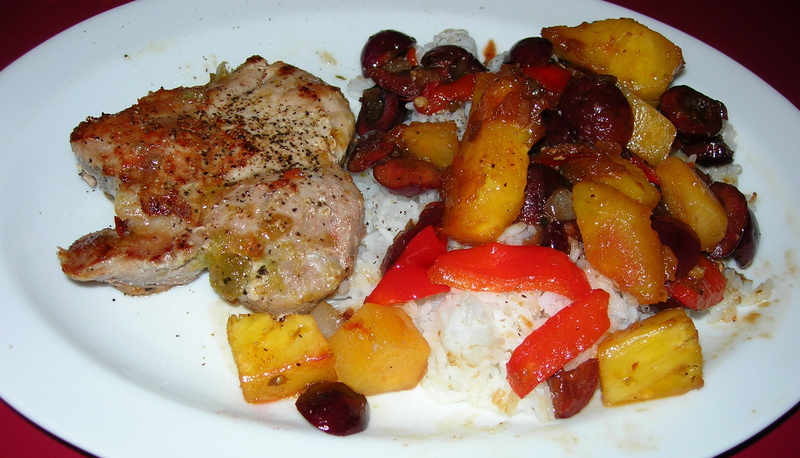 The chicken adds a nice crispiness that’s a different quality than the crispy apples and red peppers. 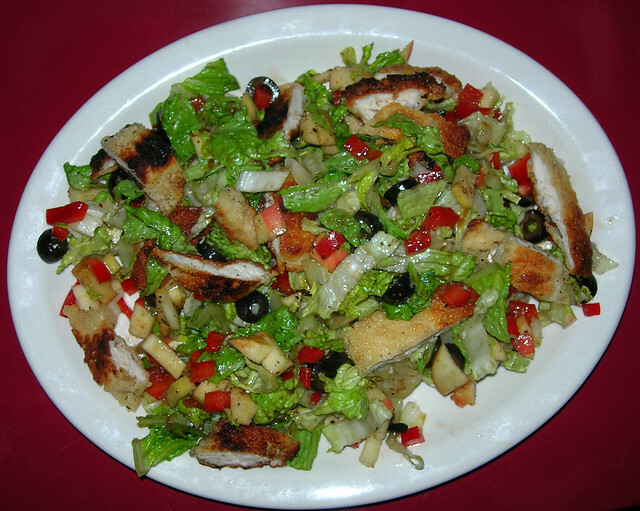 The apples and vinegar add brightness and the olives add depth while the chicken gives it that substance that makes a salad into a meal.